2013 Honda Civic Pros and Cons: Why (Not) This Car? Most early reviews of the redesigned 2012 Honda Civic took the faint praise route. Mine slammed the car. Later some others did the same. Honda, to its credit, listened to those of us who weren't kind, and reacted. Quickly. The 2013 includes far more changes than even the typical mid-cycle refresh, much less the second model year of a design. How much were they able to improve the car in so little time? My next review will cover the Nissan Sentra, and compare it to the Civic. In this review I'll primarily compare the Civic to the last compact sedan I reviewed, the Dodge Dart. Thoroughly revised interior much cleaner and coherent, plus upscale details. Why the 2013 Honda Civic? The 2012 Honda Civic wasn't pretty. It wasn't fun to drive. It didn't ride well. It outsold all other compact sedans last year anyway. Why? Because it's a safe choice. It was "good enough," and Civics have almost always been highly reliable. Even with the changes for 2013, many of the car's parts remain similar if not identical to those used in the 2006 Civic, so there's no reason to expect this to change. The Dodge Dart might eventually prove to be reliable, but in its first model year, and based on a FIAT, it's currently a gamble. Compact sedans have been getting heavier and heavier. With a midsize-like curb weight of 3,242 lbs., the Dodge Dart is the heftiest of the bunch. The Honda Civic, with a curb weight of 2,804 lbs., is nearly a quarter-ton lighter. This pays off in better fuel economy. Though its 140-horsepower 1.8-liter engine isn't direct-injected, and its five-speed automatic is down a cog compared to the Dart's (and many other 2013s'), the Civic earns very competitive (if short of segment-best) EPA ratings of 28 mpg city, 39 highway. With it's standard 160-horsepower 2.0-liter engine, the Dart's 24/34 ratings don't come close. In casual suburban driving the trip computer reported averages in the high 20s, sometimes just over 30. Hit a big green button to engage "econ" mode and employ a feather-light right foot, and mid-30s can happen. The trip computer averages in the Dart were about four mpg lower. Chrome trim also added to the tail as well. More elegant tail lights. Basic bi-level layout remains the same, but finished much more nicely. The Honda Civic's low curb weight also benefits handling. Or at least it does with the changes for 2013. Both the steering and the suspension have been firmed up and finessed. The former now has a more natural feel to it, and the latter bottoms out far less easily and no longer loses its composure the moment the road surface take a turn for the worse. Combine the new tuning with the Civic's relatively low driving position and expansive view forward and it's a very pleasant car to drive, and almost fun. The Dart also has good road manners, but feels heavier and reacts more harshly to poorly surfaced roads. Driving enthusiasts will still prefer the more athletic and engaging Ford Focus or Mazda3. But for most people "good handling" means a light, agile feel and easy steering. For them the 2013 Civic's dynamic character should be nearly ideal. I despised the interior of the 2012 Civic, with its massive, multi-sectioned instrument panel and hodgepodge of aggressively cheap materials. In what might be record time, Honda totally revised the instrument panel and door trim for the 2013. Though the basic layout remains the same, the restyled instrument panel appears much cleaner, with fewer cut lines and smoother transitions. New materials look and feel far nicer than the old ones, and form a coherent whole. Detailing is much more artful, even upscale. "Stitching" on the newly soft-touch instrument panel face and upper doors could look as fake as it is, but helps elevate the perceived quality of the interior. Overall, this year's Civic seems about $10,000 more expensive inside. The gathered leather upholstery on the seats appears as traditional (if we're being kind) as the "starship bridge" instrument panel does not. An interesting contrast, or an odd one? Both, perhaps. Between this gathered leather and a pervasive plasti-tech ambiance (also present in Acuras) the interior seems very Honda despite an instrument panel layout unlike that inside other Hondas. The Dart's interior employs two large displays, but otherwise has a more conventional yet less polished appearance. Interior dimensions haven't changed, so the 2013 Civic continues to have one of the segment's roomiest rear seats (though not in the same league as the VW Jetta). A barely there floor hump and a broad cushy center seat render the Civic more capable than most compact sedans of seating three adults, though the rear cushion is somewhat low and hip room is in short supply. You'll find more shoulder room but less rear legroom in the Dart's back seat. Midsize sedans often don't offer much more rear legroom, but their seats tend to be more comfortably positioned. Why Not the 2013 Honda Civic? Honda made a name for itself by offering conveniences like a change drawer as standard equipment. (Car buyers were much more easily surprised and delighted back in the 1970s and 1980s.) In recent decades, though, Honda has been much chintzier when equipping its cars. For the longest time they offered leather upholstery only on end-of-the-run special editions. In recent years, competitors have been loading up even small cars with features formerly reserved for big-buck luxury sedans. You can get a power driver seat, proximity key, heated steering wheel, rain-sensing wipers, remote start, auto-dimming xenon headlights, auto-dimming rearview mirror, universal garage door opener, blind spot warning system, and rear obstacle detection on the Dart. Though automatic climate control joins the Civic's roster this year, none of these other features have. 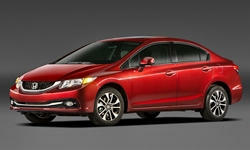 The 2013 Honda Civic's exterior appears more polished and upscale. The car's new chrome-highlighted face looks especially good. Unlike with the past few CR-Vs and the 2012 Civic, Honda has avoided both goofy and plain. But even with these changes the latest Civic remains much less attractive than the 2006-2011 car from any angle other than head-on. Its chunkier lines don't flow as well, and quick revisions couldn't eliminate the odd redundancy of both a fake and a real small pane of glass ahead of the front side windows. New face with chrome highlights much classier. Leg room among the best, but somewhat low cushion and limited hip room. It's taken me seven years, but I've just about made my peace with the Civic's massive bi-level instrument panel. The digital speedometer's high, forward location does make it easy to read. (The bars flanking the speedometer change color to indicate how economically you're driving.) But I'd also prefer the tach in that location. With two levels at two different distances, they can't both be best. Most of the Civic's controls are easy to reach and use. Those for the nav system are a major exception. Small, identically shaped and sized buttons flank a frequently washed-out screen. During the week I had the car I fussed with the nav and audio system as little as possible. Unless you really must have built-in nav, skip it. So, what's not to like? The Honda Civic's lightness isn't cost-free. The rushed revisions have significantly reduced noise levels inside the 2013, but more road noise continues to intrude than in a Dart, Cruze, Focus, or Sentra, especially on concrete. This isn't entirely a bad thing. Hearing the tires do their stuff can put the driver more in touch with the car when hustling through curves. But you'll have a more relaxing commute in the quieter cars. When the Honda Civic's feature deficit is taken into account, its price no longer seems as competitive. The tested 2013 Civic EX-L with nav lists for only $85 more than a comparably equipped Dodge Dart Limited, $24,555 vs. $24,470. (A coincidence that they're so close? Probably not.) But use TrueDelta's car price comparison tool to adjust for feature differences and the Dodge emerges with a nearly $2,400 advantage. This is only the initial price, though. Civics depreciate very slowly. Combine this with low maintenance and repair costs, and the Civic's total cost of ownership remains very competitive. Responding to critical reviews rather than focusing on the positive ones, Honda has dramatically improved the appearance and driving manners of the current Civic in just a single model year. While still not well ahead of the herd in any particular way, with these revisions the Civic is again competitive. I hated driving the 2012, but enjoyed driving the 2013. Add in the traditional Honda strengths of reliability, fuel economy, and slow depreciation, and it's again easy to see why the Civic is one of the best-selling cars. Adequate power and refinement, very good fuel economy. Competitive. Seat folds, with a 60/40 split in upper trim levels. Honda provided an insured car for a week with a tank of gas (of which we didn't quite use half). 2013 Honda Civic pros and cons, according to Michael Karesh: the best reasons for buying (or not buying) the 2013 Honda Civic. Join TrueDelta to post your own impressions. The irony is that this is a reliability tracking website. You did anyone who listented to your Honda Civic reveiews a disservice, as time has proven that there was no better choice. On the other hand buying a Dart provided many a life lesson. I work as a service writer, and I've seen quite a few Darts that are so far gone that they're no longer being repaired at retail prices. Maybe shade tree mechanics and shadier state inspection sticker vendors can keep them on the road for another couple of years, but they'll have their work cut out for them. When the warranty stops, so does the car. Did you misread the review? Reliability is listed as the top reason to buy the Civic instead of the Dart. Also, as noted in the review, it was written before we had any reliability data for the Dart, but called buying the Dodge a gamble. I read it. It included a number of references to your 2012 Civc review, a car you "slammed" and "hated driving." Anyone that didn't buy a Civic in 2012 based on your review made an inferior choice, and they did it after coming to a site that is supposed to provide useful reliability data. Consumer Reports got that one wrong too, but what's the point of mirroring their loss of credibility? The wholesale selling out of automotive journalism has created the myth that there are no more bad cars, but nothing could be further from the truth. There's a 46,000 mile 2014 Grand Caravan in my shop with water in three of its cylinders. It lasted longer than two Chrysler 200s I've seen in the past three months. Fords are little better, and many Fords are worse, as are Chevrolet Sonics. Honda has jumped the shark with the latest Civic and CR-V thanks to efforts to meet devious CAFE standards, but well informed people filled their driveways with the last generations while the shill-press told them to steer-clear. Ever wonder why "non-enthusiasts" buy the cars that work the best and are the happiest with them? It's because they aren't misinformed sheep who believe the cretins at Car and Driver instead of their mechanics. You seem to think that if a car is reliable, then no other shortcomings it has should be mentioned. But reliability is only one facet most people consider when buying a car. Cars that are reliable and drive poorly. Cars can drive well but be unreliable. They're two separate things. If someone is only interested in reliability, then they should only review our reliability stats (and speak to mechanics like yourself) and ignore reviews, which tend to focus on things other than reliability.